We’d love your help. Let us know what’s wrong with this preview of Wizard's Eleven by Sheri S. Tepper. 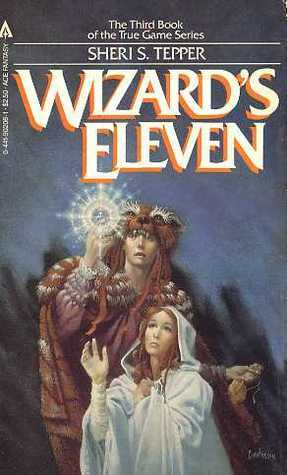 To ask other readers questions about Wizard's Eleven, please sign up. I have this fascination for the weird early books written by authors who would later develop their own styles/themes and move away from their freshman efforts--books that probably wouldn't have seen the light in today's publishing environment, but that have their own strange magic. I thought this little trilogy by Sheri S. Tepper was one of those. I don't think so any more. The True Game is weird, yes, and the early books (#1-2) certainly lack the strength of Tepper's later writing. But wow! It a I have this fascination for the weird early books written by authors who would later develop their own styles/themes and move away from their freshman efforts--books that probably wouldn't have seen the light in today's publishing environment, but that have their own strange magic. I thought this little trilogy by Sheri S. Tepper was one of those. I don't think so any more. The True Game is weird, yes, and the early books (#1-2) certainly lack the strength of Tepper's later writing. But wow! It all comes to fruition in this volume and I feel like I've just watched her writing develop in spades over the course of the short trilogy. I wish this had been published today, because it would have been in one volume--which is really how these need to be read. The first book is sparsely drawn and the characters are flat on the page, and it's all too easy to put it down there; but by the start of this book, I was entirely caught up in unraveling the truth along with Peter. Tepper adds the old “It’s really SF!” trope as a journey to discover ancient artifacts leads to a ‘tower’ that is obviously a rocket ship and a cabal of eeeevil academians holding faculty meetings on the study of monsters while refusing to dirty their hands learning to maintain their increasingly faulty equipment. Now, generally I don’t mind this sort of thing. I love mixing my F and SF. I didn’t mind it here, but I felt like soooo much more backstory was crammed in than necessary, as though Tepper was told she had to explain her entire world before she could finish the trilogy. There’s a passage which I read and re-read and fear implies that being born with disabilities makes you evil. EECH. Hopefully not intended at all by the author. And then there’s another thing that drives me nuts. A villain in the previous book, Huld, whom I took to be one of the old “Honorable lawful evil” types, who spends most of his on-screen time lamenting the excesses of his evil-er kinsman whom he is duty-bound to follow, is re-introduced here as LITERALLY a baby-eating monster villain. It made him less interesting by far and just felt… forced. Like someone critiqued an early draft of the book complaining the villain wasn’t evil enough. Oh… and then theres’ an attempt at a love triangle? Maybe? Which also seems rather forced. The third book in The True Game trilogy. In Necromancer Nine Peter went to the magician's caves found they had machinery there to take the essence of someone and put it in a blue game piece and put the body in some sort of suspended animation. After using the machinery to reintegrate one blue and body the machine failed and Windlow was stuck as a blue. After a year with Mavin, Mertyn and Himmagery, Peter feels like a fifth wheel in the High Demesne. He comes up with the idea of going to Xammer t The third book in The True Game trilogy. In Necromancer Nine Peter went to the magician's caves found they had machinery there to take the essence of someone and put it in a blue game piece and put the body in some sort of suspended animation. After using the machinery to reintegrate one blue and body the machine failed and Windlow was stuck as a blue. After a year with Mavin, Mertyn and Himmagery, Peter feels like a fifth wheel in the High Demesne. He comes up with the idea of going to Xammer to get Silkhands. I recently read Jinian Footseer which describes some of the same events from Jinian's point of view rather than Peter's. It was a bit of a spoiler, not too bad, but it also gave me a chance to compare how the two described the same situations, and retroactively laughing at some of the things Jinian says. Events in Xammer lead Peter to the north, away from the High Demesne, and ultimately towards Hell's Maw and a battle with Huld and his legion of bones. There were some clever twists, like how Peter handled the mirror men. The end of the battle against Huld and his army of dead wasn't as satisfying. Good fun read, and wonderful characters. This Book was the last in a series about Peter a necromancer, the whole series kept me gripped to the end, this book has plenty of adventure, thrills and spills, as well as hard situations our Necromancer has to try and get himself out off, there are a lot of fantasy characters not found in any other book that I have ever read. This book was written in the 1980's, but for me you have to enjoy every book on it's own merits and not compare it to others, that way you will not be disappointed and en This Book was the last in a series about Peter a necromancer, the whole series kept me gripped to the end, this book has plenty of adventure, thrills and spills, as well as hard situations our Necromancer has to try and get himself out off, there are a lot of fantasy characters not found in any other book that I have ever read. I liked the journey told in Wizard's Eleven, but found the villain to be badly developed and the ending unsatisfying. While I can't say much without spoilers, I think parts of the resolution were insufficiently forshadowed and came out of nowhere. But we got to meet the connecting characters that lead to the other 6 books set in the same enchanting world. The best in the True Game series, this book shows a lot of a advance in Tepper's writing style. Not only did the characters gain a depth and strength not shown in the previous books, but the story moved much faster than the others. Though still not a 'brilliant' piece of writing, a good start to a writing career! Very good. This book is the last book of a trilogy, you cannot really read it as a standalone, and in many ways you have to judge it as part of the trilogy. Therefore the comments from the first two books also apply to this one. In its own right, this book is a very good ending to the whole story. You must read this if you have read the first two books. So close to a 4! I wanted to give it 4 stars, but she just shot herself in the end by rushing it. The payoff could've been so much better, but again she falls victim to the brevity of her stories. Still a good read, nonetheless. Just another book in a wonderful series that if you love wizards, magic and the such then you will really love this series. Pulls the trilogy together and hints at the larger cosmology explored in the Mavin and Jinian books. Awesome. Wonderful finish! Still wondering what are the Talents of Wizards, but still cool! Enjoyable read. Though it still feels a little juvenile to me, but in a good way. Come on Peter, you have all that power in your hands, literally, use it already! Love the sausage groles! Sheri S. Tepper is AWESOME! Born near Littleton, Colorado, for most of her career (1962-1986) she worked for Rocky Mountain Planned Parenthood, where she eventually became Executive Director. She has two children and is married to G Sheri Stewart Tepper was a prolific American author of science fiction, horror and mystery novels; she was particularly known as a feminist science fiction writer, often with an ecofeminist slant.